The home at 205 Shady Lane sold for $27 million on Tuesday, becoming the fifth single-family residence in Pitkin County to bring in more than $20 million so far this year. Sales of high-end single-family residences in the Aspen area have bounced back so much in 2017 that this week’s $27 million deal isn’t the most expensive transaction so far this year, though it would have been for all of last year. On Tuesday, the 6,515-square-foot home at 205 Shady Lane changed ownership after 85 days on the market. Property records identified the buyer as Lanes End Holdings LLC, which paid cash for the five-bedroom, six-bathroom home. The seller was 205 Shady Lane LLC, a New York-based concern that shelled out $22.5 million for the riverfront home, which was built in 1987, in October 2006. This week’s price tag would have made it the most expensive home sale of 2016, a year that appeared like a slump — with $1.4 billion in property transactions in all of Pitkin County — compared with 2015, which accounted for more than $2 billion in total sales in the county. But for this year, a $30 million sale of a Red Mountain home reigns supreme so far in Pitkin County, with the Shady Lane deal second. All told, five home sales had eclipsed the $20 million mark this year through Thursday. Another 16 properties in Pitkin County have sold for between $10 million and $19.9 million, according to property records. 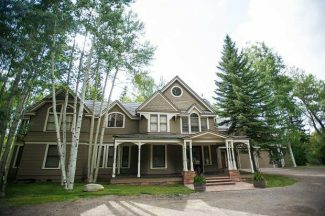 “Aspen’s just a really strong market now,” said Chris Flynn, who with Tony DeLucia and Colter Hawkes Smith of Aspen Associates Realty represented the seller. Chuck Frias worked with the buyer. For the year, sales are up about 300 percent at Aspen Associates, Flynn said, adding another broker has a property under contract for more than $20 million. In his Aug. 11 newsletter, broker Tim Estin noted the emphasis on high-dollar sales this year in some of Aspen’s most coveted areas for home buyers. He theorized that residences closer to downtown are in more demand because the City Council’s overhaul of its land-use code — which took effect in March — banned new residential development in the core. “The Aspen market is bifurcated: there’s inside the roundabout and there’s outside,” Estin wrote. “Aspen’s most coveted neighborhoods — Central Core, West End and Red Mountain — are experiencing robust sales at record prices. Another broker, James Benvenuto, noted in his Aug. 12 report that sales of fractional units in downtown’s Dancing Bear and The Little Nell Residences were up 30 percent for the first seven months of this year compared with the same period last year. All Aspen fractionals registered $20.3 million in sales from January through July, up 293 percent over last year. Sales of single-family homes through July this year, in Aspen city limits only, equated to $423.9 million — a 283 percent improvement over the same period last year, Benvenuto’s report showed. Aspen condo sales posted a 30 percent hike with $175.9 million in sales. Single-family sales in Snowmass Village haven’t been as rosy this year. Benvenuto’s data showed $75.1 million in sales through July, compared with $75 million for 2016’s first seven months. Snowmass condo sales, however, amounted to $48.3 million through July this year. That’s a 26 percent improvement over the same time frame last year.